We provide teams with plenty of barrels, ropes, half-rounds, planks, materials and eveything else that is essential to build a sturdy raft. We either recommend a venue or work with you to come to a venue of your choice. We also provide the safety staff and equipment to insure a well run, safe event. 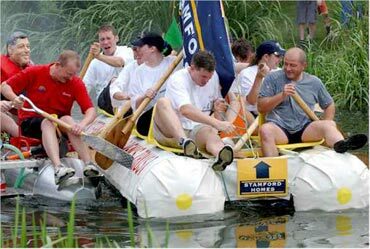 When built, the rafts will compete downstream cheered on by your team at the riverside. A day like this really does require teamwork. Teams must plan, have a strategy and have the foresight and imagination to see a large project through to success. Raft Building brings many strengths and weaknesses to the surface, and will galvanise a team through achievement.